In the championship match, all of this year’s judges read both finalists, vote for one to win, and briefly tell us how they made their choice. Here are their verdicts. Willa Paskin: Like nesting spoons in a jostling box, Warlight and My Sister, the Serial Killer, clank against each other, except when they fit together quite nicely. The former is a coming-of-age period novel narrated by a willfully dreamy young man whose life’s course has been set by an ethically complicated relative about whom he is deeply ambivalent. Tonally, it is very different from the latter, a contemporary sprint of a novel set in Nigeria, narrated by a precise, controlled young woman whose life’s course has… also been set by an ethically complicated relative about whom she is deeply ambivalent. In the first case the relative is a mother involved with the British war effort, and in the second, it’s a sister who keeps straight-up murdering people, so, you know, it’s not like these novels are the same or anything, but they both do keep coming around to the titanium bonds of family, and how those connections can tarnish, if not outright destroy, one’s own identity, behavior, and morality. I liked both of these books, but, on the subject of rotten and rotted personal responsibility, Warlight is a slowly building arpeggio, and My Sister, the Serial Killer is a read-it-all-in-one sitting, blasted, bracing chorus. It’s the one I’ll remember in a year. SJ Sindu: Both novels deal with death and betrayal. I loved the way Braithwaite brings Lagos to life, in all its modern congested glory. But I was put off by the way the protagonist in My Sister, the Serial Killer pined and self-pitied without ever taking action against her sister, who is a flawlessly beautiful, entitled, self-absorbed brat. Repeatedly, the novel reached for the easy, predictable, sensationalist narrative moves, and I grew frustrated reading it. Reading Warlight was such an intimate experience—the slow unraveling of the mystery of Nathaniel’s mother surprised and delighted me, and won me over. Evan Handler: These books are so divergent it’s difficult to offer comparison, much less declare a preference. Modern; traditional. Slim; substantial. Swift; methodical. Utterly direct; heavily veiled. I read My Sister, the Serial Killer with horror and delight, finding it nothing like the comedy some of its jacket copy suggests. Warlight was a more meandering investigation, and I wondered at both its incredible sturdiness, and the fact that I was preferring the whippet-like fleetness of Braithwaite’s first effort. Until, that is, the series of revelations Ondaatje unleashes at the end, which I found tremendously affecting. Both books are masterful in completely different fashions. I’m just sticking with the novelty of the upset. Kelsey Osgood: Before the two finalists arrived, I figured I didn’t have time to dive into something new, so I picked up an old copy of Tom Perrotta’s The Leftovers and started to casually re-read. This is relevant, because three-quarters of the way through My Sister, the Serial Killer, Oyinkan Braithwaite serves up a twist so chilling, I couldn’t turn the pages fast enough, whereas three-quarters of the way through Warlight, I found myself moping, “I wish I could go back to re-reading The Leftovers.” My decision comes down to momentum and suspense: My Sister, the Serial Killer has both in spades. Chelsea Leu: I find the spiritual-age gap between these books comically vast: one is about the delight and fraught responsibility of remembering (whether one’s life or history itself); the other is peppered with references to Uber and hashtags and social media etiquette. Despite my feckless millennial ways, I’m an old soul, temperamentally inclined toward books like the former. But I dragged myself through Warlight, found it worthy and well-wrought yet unbearably self-indulgent. My Sister, the Serial Killer smashed any doubts I had about plotty, of-the-moment, high-body-count thrillers with its cutting economy, its unerring eye, its humor. It is so damn good. Tomi Obaro: This matchup is very unfair! A young writer both literally and figuratively (Braithwaite was born in 1988) up against a 75-year-old titan of English literature. Of course, the winner is Warlight, a gorgeous, slowly unraveling meditation on memory and the ghosts of war. But that doesn’t mean that My Sister, the Serial Killer didn’t have its pleasures. I was thrilled by its kinetic energy, the genius of setting such a timeless story of sisterly rivalry in a city as brutal and fascinating as Lagos. But when it comes to the ultimate test—which book will I definitely reread—it’s Warlight. 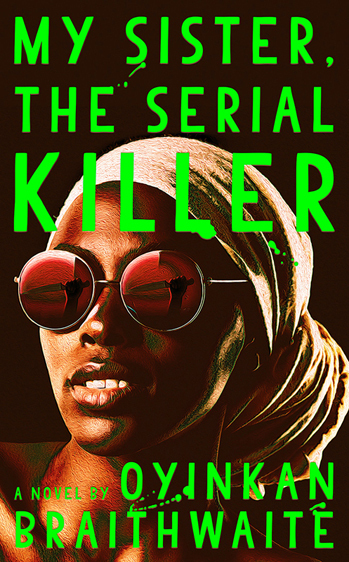 Rion Scott: Oyinkan Braithwaite’s My Sister, the Serial Killer is not a novel that I’d likely pick up on my own. The premise seems hokey—a young woman recounting her sister’s black widow-like tendencies to murder her boyfriends. Michael Ondaatje’s sober Warlight offers a sharp contrast to My Sister, the Serial Killer—sensitively observed, well-crafted sentences in the life of a man trying to make sense of a fragmented life. Braithwaite’s novel though, with its short chapters and page after page of absurdities, perfectly satirizes our shallow, brainless age. It’s an of-the-moment book with a subtle complexity. For me, My Sister, the Serial Killer wins the day. Sandy Allen: I’d lug around Warlight all day, willing myself to crack it. Whenever I did, I’d wind up wondering instead about stuff like what this book was actually about, or what anyone else had liked about it, or why this is the book we’re considering for this honor. My Sister, the Serial Killer on the other hand, I consumed hurriedly, thrilled by both the story and the tidy execution. Murdery books aren’t usually my speed but I am genuinely glad to have been made to read this one. It was about so much more than I’d have guessed. Molly Fischer: What an unlikely pair to cap off the year in books. On one hand, the lightning-quick My Sister, the Serial Killer. On the other, the ponderous Warlight, a book like an Oscar-bait movie, freighted with well-worn signifiers of seriousness, like chess and World War II. Do I even like reading? I found myself wondering as I slogged through Warlight. Why do I do this, again? I didn’t think that while reading My Sister, the Serial Killer, so it’s my choice for this match. Kate Petersen: Down to the wire, for sure. My Sister, the Serial Killer was captivating in the best and original sense: it held me captive from first page to last. Warlight seemed a more elective pleasure—a song I had to quiet myself down to hear. And though I’m a little older than I was in that first round, my rubric holds: Do I pick the world as it is, or the world as it could be? My Sister, the Serial Killer is a harrowing carousel that picks us up and drops us off in the same place; its smart structure—shaped by characters acting out of impulse, trauma cycles, and impunity—demands this. Conversely, Warlight seems river-cut by the accretive and sometimes erosive search for fact; it carries us, alongside Nathaniel, into a fuller understanding of consequence. “I am attracted to these surprising liaisons,” he admits near the end, “such sutras of cause and effect.” I am too. Just as I am to Nathaniel’s assessment that “the one hope given us…is that we change.” I share that hope, and choose Warlight. Perhaps choosing on such grounds is more wish than verdict. But if I can’t spend my wishes on fiction, then where are they still good? Zan Romanoff: I write young adult novels, so I found the first two thirds of Warlight enrapturing: I loved the book’s lyrical, romantic look at an off-kilter adolescence. It seduced me patiently, carefully. And then in the last third it became a different novel entirely, and I fell right out of love. Warlight is gorgeously crafted, but prose without a put-together plot always ultimately leaves me cold. Reading it, I found myself missing My Sister, the Serial Killer’s propulsive energy: how much it made me care about what would happen next. Christy Heron-Clark: It’s impossible to pit one book against another with a universal outcome: What resonates deeply with me may earn a shrug from the next person. That’s the beauty of novels and the individualism of readers. Books leave a residue in our life that lasts long after we forget the details that enchanted us between pages. It’s that atmospheric film that stays with us, invoking characters and places long after we’ve departed their company. It also determines what books we recommend when someone asks. In those moments, I will lean forward and whisper the name of a warmly satisfying read: Warlight. Myriam Gurba: Camp sentences like “It takes a whole lot longer to dispose of a body than to dispose of a soul” are among the reasons why I choose My Sister, the Serial Killer over Warlight. I read books for words and ideas but I also read books for their sensibility, and while Ondaatje has honed a style that is pure elegance, Braithwaite created something that invigorates and rewrites genre, and for that deserves a crown. Arianna Rebolini: Warlight enveloped me. It moves softly, almost dreamily, through World War II-era London and beyond, lingering among a complicated family hiding secrets among them. Reading it was a mood, drenched in history. But My Sister, the Serial Killer jolted me. The first page made me sit up straighter, at full attention; it grabbed me and didn't let go until long after I finished. Which I guess is to say I enjoyed the experience of reading My Sister, the Serial Killer more—and for me, that's enough to win. Avital Chizhik-Goldschmidt: This final matchup I found especially challenging, because both Warlight and My Sister, the Serial Killer were so different, in so many ways—and each deserved its own accolades. Warlight I already reviewed. My Sister, the Serial Killer has razor-sharp wit, perfectly capturing the modern moment (oh, those Instagram posts), as it follows a Lagos woman who kills her boyfriends, and her horrified sister, a hospital nurse. I deeply enjoyed the way My Sister, the Serial Killer deftly pushes aside murder (!) to explore the bonds of sisterhood. The only reason that, to my mind, Warlight wins this round, is that for some ineffable reason, it lingered within me longer than My Sister, the Serial Killer did—I suspect because of the way Warlight employed layers of narrative. I love a story with several tales in parallel, a chorus of voices and times, all tied to one central mystery. Warlight, with all of its shortcomings, excelled at that. Nichole Perkins: I honestly don’t even know how this could be a contest. Warlight was a beautiful chore, but My Sister, the Serial Killer is a delicious treat I devoured too quickly. I’m so glad it made it to the championship. It had many of my favorite elements: humor, wit, murder, women misbehaving, and daddy issues all wrapped in thrilling, sharp commentary. It feels like I’ve been waiting for My Sister, the Serial Killer all of my life. J. Howard Rosier: Two mysterious, spectral novels—Warlight is le Carré to My Sister, the Serial Killer’s Turn of the Screw. Both are restrained, but in different ways. novels—Warlight is light on its feet and low-volume, whereas My Sister, the Serial Killer is laconic, but compressed and suspenseful. But those latter qualities belie a terrific sense of humor that is constantly jumping up and cutting through its tension. I was impressed, then eventually frustrated with how airy Warlight felt. Its language was well-thought-out, but its tone vacillated too much between quiet and flatness to affect me. As the Commentariat so fervidly put it, Oyinkan Braithwaite got a raw deal going up against Richard Powers in a banner year. But My Sister, the Serial Killer strikes me as one of the most interesting tomes I’ve read in awhile, and one of the most difficult to explain. It wins. You just have to read it. Thank you to Quail Ridge Books for sponsoring today’s match! Quail Ridge Books of Raleigh, NC, is an independent bookstore with a friendly, knowledgeable staff dedicated to providing the best in customer service. Founded in 1984 by Nancy Olson, the store provides a wide variety of carefully selected books, events, discussion groups, and town hall meetings. Current owner Lisa Poole bought the store in 2013. Quail Ridge Books is the host of the podcast Bookin’ With Jason Jefferies, and is the primary sponsor of the North Carolina Book Festival. The store has been a Publishers Weekly Bookseller of the Year, and has been the recipient of both the Haslam Award for Excellence in Bookselling and the Pannell Award for Excellence in Children’s Bookselling. Upcoming events include Amy Hempel on April 8, Belle Boggs on April 17, and Ocean Vuong on June 7. Follow Quail Ridge Books on Facebook and Twitter. John Warner: For the second year in a row, following last year’s victory of Fever Dream over Lincoln in the Bardo, a weird little book has taken the Rooster, and I can’t help but feel a little jolt of pleasure over this fact. It can be tough for weird little books to elbow their way into prize contention, but that doesn’t seem to be a hindrance with our format. Judging from the Commentariat in the opening round, when My Sister, the Serial Killer went down to The Overstory, this feels like it’s going to be a crowd pleaser as well. As usual, I am blown away by the depth, breadth, and quality of engagement among the ToB followers and fans, even when they’re saying things that make me feel like I missed the boat on one book or another. That seems to me to be one of the points of this exercise, to have one’s views challenged and expanded by the views of others. Of all the novels in this year’s ToB, The Overstory is going to remain the book that sticks with me over time, I think, but you won’t find a bad word from me about this result. Kevin Guilfoile: I was rooting heartily for My Sister, the Serial Killer, but I am honestly surprised by the number of lengths it won by. Four of these judges had already advanced Warlight, while only one had previously voted in favor of My Sister, the Serial Killer (and one had previously voted against it). After The Overstory match, I worried that next to Warlight, too many judges might dismiss it as slight. I’m delighted at the number of readers who recognize how subversive it is. When you see how many in the Commentariat were actively rooting for My Sister, the Serial Killer (and how many had voted for it to Zombie, despite the fact that it was released late last year), it perhaps becomes easier to understand how we ended up with this result. My Sister, the Serial Killer is simply a book with passionate fans. Rosecrans Baldwin: And here’s a response from Oyinkan Braithwaite on her 2019 Tournament of Books win! She ultimately declined to receive a live rooster, and instead we’ll be making a donation to 826 National in My Sister, the Serial Killer’s name. Kevin: As always, we have a lot of people to thank on our way out the door. Rosecrans and Andrew do most of the work on this project, and they also ran the commentary booth for one of this year’s matches. Thank you also to Jessica Francis Kane and Pitchaya Sudbanthad for their terrific commentaries this year. Please check out their new novels, Pitchaya’s Bangkok Wakes to Rain and Jessica’s Rules for Visiting. We also want to thank Nozlee Samadzadeh, the ToB’s recently retired producer, who stopped by the commentary booth during the opening round. If you weren’t already aware, the ToB is what it is today largely because of her tireless efforts over the years. Andrew Womack: And a new addition to our ToB team for the 2019 edition is Meave Gallagher, who worked around the clock moderating this year’s comments. Thank you to her, and thank you to everyone in the Commentariat. Every single day of this year’s Tournament you provided thoughtful discussion of the day’s decision and were welcoming to new commenters. A Kind of Mirraculas Paradise: A True Story About Schizophrenia by Sandy Allen; Mean by Myriam Gurba; It’s Only Temporary: The Good News and the Bad News of Being Alive by Evan Handler; How to Disappear Completely: On Modern Anorexia by Kelsey Osgood; Lilith, but Dark by Nichole Perkins; Grace and the Fever by Zan Romanoff (whose LOOK is forthcoming in 2020); The World Doesn’t Require You by Rion Amilcar Scott; and Marriage of a Thousand Lies by SJ Sindu. And I don’t want to forget Rosecrans himself, whose books are amazing but also check out the incredible longform stuff he writes for GQ. John, I want to be sure to mention not one but two new books you have published in the last couple of months: The Writer’s Practice, and Why They Can’t Write. These are important works about the craft of writing and the state of writing instruction, they have been widely celebrated within the teaching community, and I recommend them both highly. John: Thank you, and if I can keep this log rolling: You co-wrote an indie feature film (based on a short story you published years ago) that made it into theaters around the country last fall. It’s a dark comedy called Chasing the Blues featuring both Jon Lovitz (!) and one of the kids in tracksuits from The Royal Tenenbaums. Its Rotten Tomatoes score is north of 80 percent, and it is currently available to rent on Amazon Prime and on-demand cable. Rosecrans: Thanks, John and Kevin. And now, if Andrew and I can slip in a couple things before each of us takes a gigantic nap—first off, a huge round of thanks to Jim Coudal and all the good people at Field Notes, our longstanding presenting sponsor, who help to make all of this possible. Make sure to grab some of their limited-edition, charity-supporting 2019 Rooster notebooks while supplies last! Not to mention all of the other cool stuff they make. Andrew: And finally, our enduring thanks to all our our Sustaining Members. We often say it, and it couldn’t be more true: The Tournament of Books happens because of your support. You may only see us one month a year—or four months, if you stop by for the summer tournament—but we’re working behind the scenes on one aspect of the Tournament or another year-round. And your support absolutely fuels that. Thank you. First, we have two winners to announce in our contest to see who could predict the outcome of our championship match. Of everyone who guessed, nine of you arrived at the correct answer. We then turned to random.org to randomly select our two winners, and they are Sara Bailey and llj! Please email talk@themorningnews.org with your contact details. You’ll be receiving some Field Notes notebooks and other swag as well as some ToB merch. Congratulations to you both! Next: We saw over the past couple of days that many of you in the Commentariat were listing your favorite fiction so far from 2019. We’ll be going through those comments to pull together a complete spreadsheet of the books mentioned in those threads, but if you want to mention any of the 2019 novels you’ve been enjoying or are looking forward to reading, please feel free to add those in today’s comments. The full list will be added as a comment below sometime in the next few weeks, and we’ll also post an announcement about the list in the Rooster Newsletter (sign up here!) as well as on Twitter and Facebook. And: We’re going to be back in June with the third annual edition of our ToB summer event! This time around, we’re changing the format: you, the readers, will choose all six of the books we’ll be reading, and the winner will earn an automatic berth in the 2020 Tournament of Books. So stay tuned for more news about that! Oh, and one other thing: Are we planning on awarding two Roosters in 2020? And will one of them be a Super Rooster*, a Rooster of Roosters, crowning a separate Tournament that will only feature books that have already won the ToB? Like I said, stay tuned. *Proper name TBD. Feel free to leave suggestions in the comments. New 2019 Tournament of Books merch is now available at the TMN Store. As a reminder, Sustaining Members receive 50 percent off everything in our store. To find out why we’re asking for your support and how you can become a Sustaining Member, please visit our Membership page. Thank you. We all feel passionately about fiction, but “you’re an idiot if you loved/hated this book that I hated/loved” isn’t an argument—it’s just rude. Take a breath.